TCP Code compliance watchdog Communications Compliance has appointed Christiane Gillespie-Jones to the key role of Executive Director. As Communications Alliance’s Manager of Policy and Regulation, Gillespie-Jones was closely involved with the process that produced the new Code, and is well placed to help drive its implementation. Communications Compliance chair Deirdre Mason welcomed the new exec director, citing her ‘in-depth knowledge of the Code, its genesis and the environment it operates in’ and her ‘rich experience’. Comms Compliance has a job of work to do in the next few months, to establish its operations in time to handle the Code’s critical compliance processes, which kick in during the first quarter of 2013. TCPCode.com.au congratulates Christiane on her appointment. 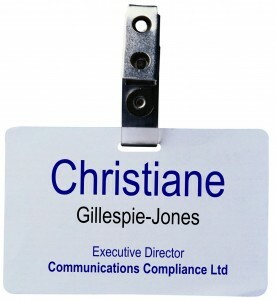 This entry was posted in Communications Compliance Ltd and tagged communications compliance, gillespie-jones. Bookmark the permalink.